The Main Stream Media (hereafter MSM) has, in the last few weeks reported on a couple of UFO related stories that could have had some significance if any of the alleged reporters had ever had an original thought. The clues were there, if they could think beyond the next martini... though I suppose their battle cry, “Fake it until you make it,” tells us something about them. First there was the big hoopla over an FBI document that suggested there had been a UFO crash. But there were no names attached as the source and the information seemed to be that from the Aztec, New Mexico hoax of 1948. All of the information had appeared in magazines and books in the late 1940s and early 1950s. Without any names, vague locations, and general information, there wasn’t much to do with it. What the MSM missed, was the fact that the document existed at all. Why would an FBI agent submit something like this? Obviously because he had orders to do so. No, not him specifically, but FBI agents in general. They were to be on the lookout for UFO related information. We could go back to the July, 1947, when the then Army Air Forces requested FBI assistance in UFO investigations. J. Edgar Hoover, the then director, said that he would do it, but they had to be let in on all UFO information. Hoover mentioned “discs recovered” in his response, in this case a hoax from Shreveport, but the point is the FBI was interested in UFOs. The document in question showed that several years later, the FBI was still gathering UFO information regardless of the source or reliability. If the situation had changed in those years from Hoover’s order... if the situation was such that the Air Force knew that there were no flying saucers, wouldn’t they have told the FBI? And then, wouldn’t the FBI stopped gathering UFO information, especially when that information was on the lunatic fringe side? So, the reporters just told us that the document was out there, though we had known that for more than two decades. They didn’t bother to check around. They didn’t bother to see if there was anything important in the document. They just wrote their stories, their superficial stories, and ran off to the next one. They simply didn’t understand. And then, second, we have to put up with the latest nonsense about Roswell, from a MSM reporter whole knows nothing about the case, has little clue about Area 51 and apparently knows next to nothing about aviation history. Hell, she doesn’t even know that Area 51 didn’t exist in 1951 and that it wasn’t named that because of alien bodies brought there in 1951. Here’s the point. The MSM rejects the idea of alien spacecraft, looking down their noses at those of us who believe the evidence for visitation is persuasive. They are uninterested in looking at the evidence, but they do know that UFO stories and documentaries are good for ratings. So, while they’ll make fun of UFO reports and UFO sighters, they will also be sure to devote time to them to boost their ratings. In fact, I just heard someone on television make the crack that those who see UFOs live in the rural south and don’t have a full set of teeth. Of course the MSM doesn’t know, and doesn’t care, that the best sightings come from those with college degrees and who had an opportunity to observe the UFO for a minute or more. It’s just easier to continue with the stereotype because to do otherwise would require some research. 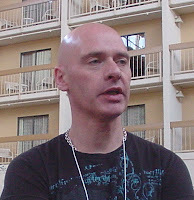 For more than twenty years I have been publishing books about UFOs and UFO sightings. They range from The UFO Casebook which looked at a history of UFO reports with some commentary about those sightings to the highly skeptical The Abduction Enigma which suggested that alien abduction has a terrestrial explanation. Of course The Abduction Enigma was overlooked by the MSM, though it would have reinforced their belief structure. They were more interested in a book published a decade later that reached the same basic conclusions that we did with The Abduction Enigma. We even had some of the academic credentials that the MSM like, but they ignored our book. The preferred the derivative book that came out later that gave no credit to the work we had done. The real question here is if the MSM can’t be bothered with learning about a topic before they report on it, if they can’t be bothered with understanding what is happening, why should we accept anything they have to say about... well, anything? Sure, you can say that reporting on UFOs is not up there with combat reporting, or election reporting, and those in the MSM take that seriously. While in Iraq, I happened to see Ted Koppel reporting on the conditions of the schools in Baghdad. He was at a school where he had found an open sewer just inside the school grounds. He was reporting on how horrible the conditions were. My response? We had repaired, updated, and donated books, supplies and even computers to some 2500 schools in Iraq and he found the one we hadn’t gotten to yet. He made no mention of all that good work done by American soldiers. Second, as I was working on a paper in a master’s program, I was reviewing the TET Offensive of 1968. Never mind that the reporters were caught off guard, though the military wasn’t... just look at how many high-ranking officers and political leaders predicted the offensive in the months before (even the ARVN First Division recalled its soldiers 48 hours before the launch of TET). Never mind that the reporters all reported from the Colon section of Saigon where there was great damage (for historic and racial reasons) but not from much of the rest of the city which was not on fire (flames and burning buildings look much better on the news than a downtown street with no damage). So, they don’t get it when it comes to UFOs and in the greater scheme of things, that’s not as important as so much of the other things they don’t get. They just quote one another and worry about filling their time on the air rather than understanding what is really going on. It is time that we stopped listening to them, their “informed” sources, and realize they just don’t have any inside track, inside knowledge, or even a realistic comprehension of the world around them. They are there to promote themselves, get into the big time, and make the big bucks. They often just don’t care about the truth. How do I know? Nearly twenty years ago, just before an interview with a reporter for a major daily newspaper, I said that we could prove much of what we said about UFOs. The intern (no they wouldn’t waste the talent of a real reporter on this) said that the editors didn’t care. They knew there were no UFOs. Just how do you fight that? Okay, let’s see if I have this straight. In 1947, the officers and men of the 509th Bomb Group found the remains of a crashed flying saucer. 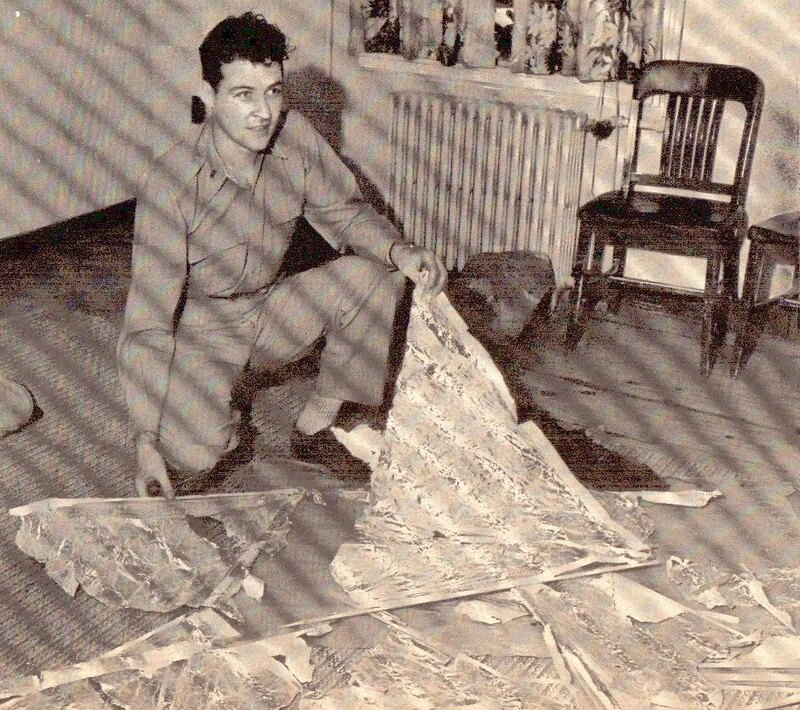 They took parts of it to Fort Worth where Brigadie r General Roger Ramey and one of his weather officers, Warrant Officer Irving Newton (seen here), identified it was a common weather balloon and radar reflector. The press, which had been very interested, suddenly couldn’t care less and didn’t ask how the highly trained officers of the only nuclear strike force in the world at the time could make such a stupid mistake. They didn’t wonder if the men with their fingers on the triggers might not be as trustworthy as everyone hoped. No, they bought the story and went on their way. Then Jesse Marcel Sr., who had been the air intelligence officer in 1947, began to tell ham radio friends that he had picked up the pieces of a flying saucer in 1947. Articles were written, followed by a book, but the Main Stream Media (hereafter MSM), yawned because they knew that there were no flying saucers The Air Force had said so. 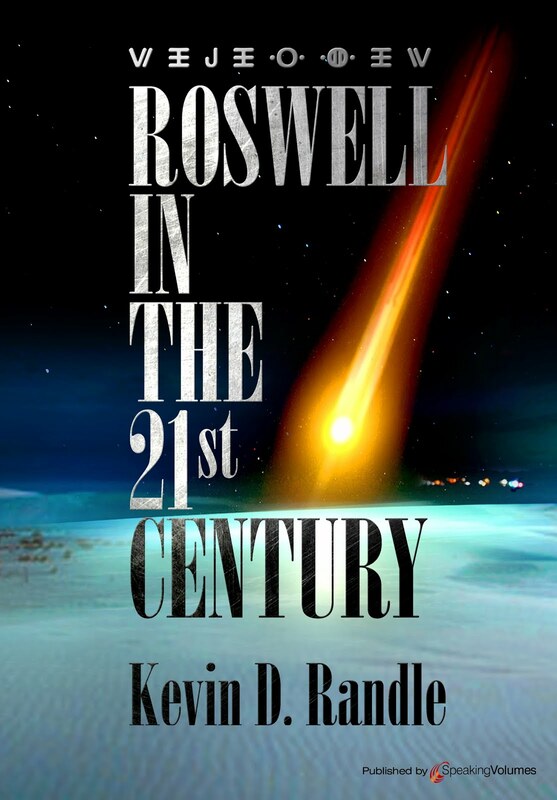 Interest in the Roswell crash built anyway and move articles and books were written. Television documentaries were made, many times without unnamed sources, but the actual people appearing on camera to tell their tales. MSM yawned because these were crazy old men and women whose memories were playing tricks on them. Besides, there were no flying saucers because the Air Force said so. But suddenly there was real interest and a New Mexico congressman began to ask questions about the Roswell UFO crash. He wanted an investigation into this. The MSM paid attention because Steven Schiff was a real congressman and that made the story credible... though why escapes me... which is not so say that I didn’t find Schiff credible. The Air Force investigated, issued a final report, and found that what fell at Roswell was a... weather ballo on. Oh, no longer was it just a regular weather balloon, it was Project Mogul, so highly classified that not even the scientists working on it knew the name. This became the accepted truth because the Air Force said so. 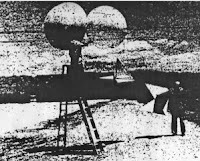 Of course Project Mogul (balloon launch seen here) was just regular weather balloons and rawin radar reflectors, just like the tens of thousands that had been launched all over the country for years and there was no reason to be fooled by them even if they were tied together in long arrays. Project Mogul turned out not to be so highly classified... just the ultimate purpose was. But the MSM bought the story because there were no flying saucers. The Air Force said so. No one in the MSM bothered to ask a couple of simple questions like, “If you’re investigating a UFO crash in New Mexico, why didn’t you interview the more of the men who were there at the time? Why just Sheridan Cavitt? Why not Brigadier General Arthur Exon? Why not Patrick Saunders? Why five men who worked on Project Mogul, some of whom weren’t even in New Mexico in 1947? No one in the MSM thought about that. “But what about the bodies?” someone, not a member of the MSM, asked. The Air Force came out with a second final report to explain the bodies. These were anthropomorphic dummies dropped during high altitude parachute and balloon tests in the 1950s. Never mind that the earliest any were dropped near Roswell was 1957 and that the dummies looked exactly like what they were. This is the solution and the MSM believed this nonsense because the Air Force said so. 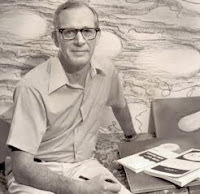 Then my friend (at least I think of him as a friend) Nick Redfern (seen here) said, “Not so fast.” He had uncovere d information that suggested the recovery at Roswell was really the end result of experiments using deformed Japanese and some kind of experimental craft. At least this provided a reason for the cover up... not some kind of secret balloons. Not many accepted this and the Air Force remained silent. I think they had learned their lesson. Don’t get involved in these crazy flying saucer stories. Leave it to the kooks, which is not to say that Nick is a kook. But Redfern was wrong about this and we know because a “journalist” meaning a person with ties to the MSM has said that the Roswell crash was the result of a collaboration between Joseph Mengele and Josef Stalin using stolen Horten Brothers “flying wing” type aircraft to give it an alien appearance. Never mind that the Air Force had access to the Horten Brothers designs after the collapse of Nazi Germany and should have recognized the craft if that is what it was. But the MSM media listens to this because Annie Jacobsen, who is a contributing editor of the Los Angeles Times Magazine said that she interviewed a guy, who remains nameless and he said so. Deformed children the result of the horrific “experiments” of Mengele in some kind of Horten Brothers flying wing for the extraterrestrial flavor. Stalin thought this “War of the Worlds” scenario would create public panic, though I’m at a loss to understand what he would have gained by this. Did anyone ever notice that the Nazis and Stalin were enemies? Did anyone notice that Mengele had fled to South America and was no longer any sort of important person in 1947? Enough of this latest nonsense. I do not understand why the MSM will listen to this sort of uncorroborated crap, but will ignore the information provided by the men and women who were there. 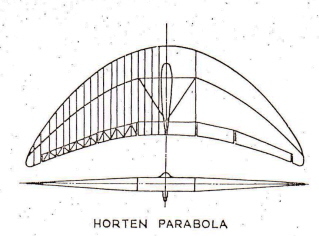 Clearly the MSM does not have a grasp of history, they don’t know that we, meaning the Roswell researchers looked at the Horten Brothers aircraft designs(seen here) (and that we know the flying wing is inherently unstable and didn’t work well until computers could compensate for the tendency of the craft to flip) and we looked at many alternative explanations. We can stop now because we have the answer... Stalin, Mengele, deformed children and a bizarre attempt to create a panic in the US is responsible for the crash... But when the Air Force buried the story, why didn’t Stalin pull a few strings at his end to interest the MSM? Why’d he let it die? And for those interested, I have said for years that the big secret at Area 51 was that it was where the next generation of military aircraft were tested. It has nothing to do with UFOs... but the MSM isn’t interested in that opinion either. 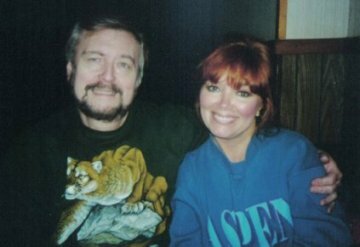 Brad and Sherry Steiger (seen here) have turned out another winner with their Real Aliens, Space Beings and Creatures from Other Worlds. The title, I think, says it all. 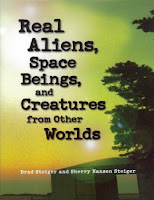 This is a book about aliens, t hough not necessarily from other planets. We’ll get to that in a moment. First I should point out that I have known Brad Steiger for decades. We have talked on the telephone many times, we have emailed one another frequently, and we have appeared on radio shows that the other hosted. I knew, when I had a Saturday evening show on KTSM that I could always call Brad at the last minute if a guest canceled, and I knew that he would be an interesting interview. The first time that I spoke to him, which I’m sure he doesn’t remember was as I was writing my first book on the paranormal. As a reference, I was using a book he had written. I was interested in the story of Oliver Thomas, a Welsh lad who had vanished in 1909 as he carried water from the family well. I happened to know where Brad lived at the time and I was able to get his telephone number from directory assistance. I called and asked my question about the case. “It’s a hoax,” Brad told me. My own experience has been that too many people will lie about too much for reasons that seem to be vague. They’ll lie for the personal glory. They’ll lie for the little fame it might bring them. They’ll lie to put one over on someone else. They’ll lie just for the hell of it. Anyway, Brad was quick to tell me the truth and I certainly appreciated that. So now we have a new book by Brad and Sherry and it is a compendium of tales about alien creatures that might come from other planets, might be travelers from our future or might be interdimensional beings. They cover all the theories here. They begin with the biggest of the UFO cases which is the Roswell UFO crash and wind their way through the history of alien contact whether from the contactees of the 1950s, the abductees of the 1990s or the sightings by people of strange being s throughout the centuries. This is a book for the novice, who has just discovered the UFO field. It provides the basics to understanding where we have gone since the beginning, providing a glimpse into UFOs. 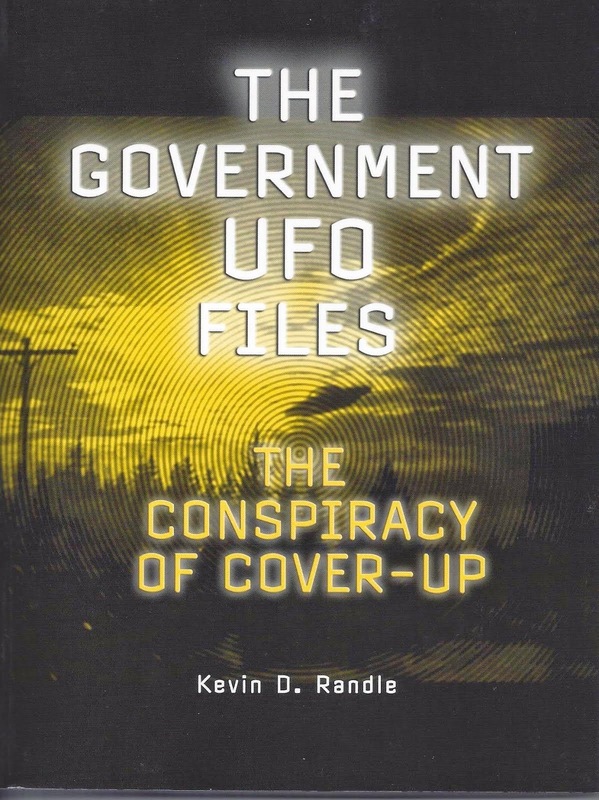 This is a book for those who have been around for a while but who have had their research diverted into one of the many subset of the UFO phenomenon. It provides the basic information so that detailed research can be designed for a long term study. For those who wish a good primer on UFOs, and for those who wish an encyclopedia of information about the last fifty or sixty years of alien adventures, this is the book to have. It is literally everything to everyone. If I were to complain about it, I would mention that it is not as detailed as I would like, but then the book would probably have been so big that you’d need a crane to lift it. If there is a case for which I need additional information, Real Aliens, Space Beings, and Creatures from Other Worlds provides the starting point. It gives me the clues I need for my specialized research. To prove my point, that those who offer solutions to some of the UFO cases are not invited to many conferences, I have just learned of an event in Kingman, Arizona in celebration of the UFO crash there. It seems to make no difference that the sources for this information about the crash is shaky at best. Anyone who has an alleged UFO crash near them seems to be gearing up for a festival of some kind. The original story, as near as I can tell, came from a fellow who was originally identified as Fritz Werner. He told of a classified mission he had been assigned in May 1953. According to what he told UFO researchers, he had bee n flown to Phoenix and then bused to a site in Arizona that he believed was near Kingman. Once on site, he engaged in important and classified work. All well and good, but there is no evidence that Werner was ever a member of Project Blue Book. Later he would be interviewed by Ray Fowler. He would give a slightly different version to Fowler, but explained that he’d had been drinking martinis prior to that first interview with Young and Chetham. That would explain the discrepancies because he tended to make things up when he drank, according to him. Later we would learn that Fritz Werner was really Arthur Stancil and later that his name was Arthur Stanse l. The story would be unsupported by any documentation other than a notation on Stansel’s personal calendar for May 20 and 21, 1953. And that’s it. That’s the extent of the documentation. Jottings on a calendar that could mean practically anything... and a note that he had a job he couldn’t talk about. Not the brightest thing to have written down if he truly had a job he couldn’t talk about. I will note that searches of the local newspapers, meaning those within 100 miles including Las Vegas, have turned up nothing. No UFO sightings at the right time and nothing to suggest that something crashed. Just the story told by Arthur Stansel, first to two young neighbors and later to Ray Fowler. And with Stansel telling everyone that when he drank, he told stories, his credibility suffers. He told Fowler that he had had four martinis before the young men showed up. I don’t know why he would continue to push the story when Fowler arrived except that he might have liked the attention the tale drew. But then Don Schmitt told me of a second witness... well, not exactly a witness, but someone who could corroborate the tale. According to the information he gave to me, Judie Wolcott said that her husband had been in the control tower the night the object crashed. Later, after he had been sent to Vietnam, he wrote her a letter that mentioned the UFO crash. He didn’t supply many details and said that he would tell her more when he returned. Unfortunately, he was killed in Vietnam and the letter he wrote had disappeared. Okay, that was corroboration, after a fashion. It would have been nice to have the letter, especially since it would have been dated before Stansel told his tale to Fowler and that tale found its way into a national UFO magazine. Then the daughter of Judie Wolcott called me and told me that her mother tended to make things up and that her father had not been killed in Vietnam. In fact, neither of the men Wolcott had married were killed in Vietnam. There was no letter and no strange confession. So, there really was no evidence for a Kingman crash. We can find no trace of it in any of the documentation and this includes the newspapers of the time. Remember, all the crashes that have some solid supporting information also have newspaper articles about them. Roswell, Las Vegas, Shag Harbour, Kecksburg and so on. Many of the alleged crashes listed on so many web sites have newspaper articles about them, even when we are able to put a mundane answer on them... but not so Kingman. Hey, I hope their festival was a great success and that those in attendance learned something of importance. I hope they do it again next year and that it becomes a tradition in the town. Kingman is a nice little city and I have always enjoyed my time there, limited though it might have been. This little piece is not quite as altruistic as it might seem. I have a long article about the entire Kingman Crash story in Philip Mantle’s UFO Matrix, which has just been published. You can view information about the magazine at http://www.ufomatrix.com/. But there was no UFO crash there... there was one a couple of hundred miles northeast in Nevada in 1962 but nothing near Kingman. Maybe Las Vegas incident was close enough. Not all that long ago, I found a report on the MUFON Symposium held in Denver, Colorado in 2010. The author reported on my presentation which was a tribute to Len Stringfield (seen here) and the pioneering work he had done on UFO crash/retrieval cases. I pointed out that Len had opened the door for the rest of us, and a subset of the UFO field, that is crash/retrievals, was now something that was viewed with new interest and new respect. If not for Len’s work, we wouldn’t be looking at these cases simply because we had been "educated" by the destruction of the Aztec UFO Crash case and the information about the reliability of the two men who were at the heart of it. In his landmark paper, Len began with what seemed, in 1978, to be a strong report given the source of the information. I confess that the fact the witness claimed to be a retired Air Force colonel colored my thinking about it. In fact, in A History of UFO Crashes, I gave the case high marks. Later, in Crash - When UFOs Fall from the Sky, I would reevaluate the case. I thought of it as taking it to the end, which, I believe Len would have wanted. 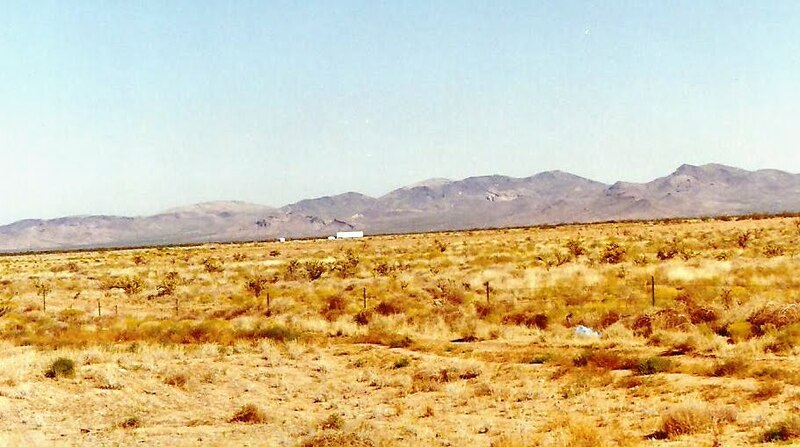 In 1948, according to reports from hazy sources, a UFO with occupants numbering anywhere from one to sixteen, had crashed in a desert region of the southwest United States or Mexico and was retrieved by U.S. military authorities. But the reports never got beyond rumor because 1948 was the year when Frank Scully’s book unloaded an alleged hoax on the public about a crashed UFO in Aztec, New Mexico. In the Fall of 1977 new word of a 1948 crash came to me from a well-informed military source. His information, however, was scanty. He had heard from other "inside" military sources that a metallic disc had crashed somewhere in a desert region. His only details indicated that the craft had suffered severe damage on impact and was retrieved by military units. By coincidence, months later in 1977, I was to learn more about a crashed disc occurring in 1948. This came from researcher Todd Zechel, whom I had known since 1975 when he became Research Director of Ground Saucer Watch. Formerly with the National Security Agency, Zechel stated that an Air Force technician told him that his uncle, then a Provost Marshal at Carswell Air Force Base near Ft. Worth, Texas, had taken part in the recovery of the crashed UFO which was described as a metallic disc, 90 feet in diameter. The crash occurred about 30 miles inside the Mexican border across from Laredo, Texas, and was recovered by U.S. troops after it was tracked on radar screens. The job assigned the Provost Marshal, now a retired colonel, was to cordon off the crash site. The retired colonel [Provost Marshal], now living in Florida, was tracked down by Zechel. Among other facts revealed by the colonel was that one dead alien was found aboard the craft which was described as about 4 feet, 6 inches tall, completely hairless with hands that had no thumbs. Zechel learned from his source that the troops involved in the retrieval were warned that if they said a word about the incident they would be the "sorriest people around". Continuing his investigation, Zechel pieced together other eyewitnesses to the 1948 event. In his statement, Zechel relates the following: "I traced another Air Force colonel, now retired in Harrisburg, Pennsylvania. He had seen the UFO in flight. He was flying an F-94 fighter out of Dias [in reality Dyess] Air Force Base in Texas and was over Albuquerque, New Mexico, when reports came of a UFO on the West Coast, flying over Washington State. Radars clocked its speed at 2,000 miles per hour. It made a 90 – degree turn and flew east, over Texas. The colonel, then a captain pilot, actually saw it as it passed. Then suddenly it disappeared from radar screens. At Dias base, the radar operators plotted its course, and decided it had crashed some 30 miles across the Mexican border from Laredo. When the captain got back to base, he and a fellow pilot got into a small plane and took off over the border after the UFO. When they landed in the desert at the crash site, U.S. troops were there before them. The craft was covered with a canopy, and the two pilots were not allowed to see it. They were then called to Washington, D.C. for debriefing and sworn to secrecy about the whole event. Those are the basics of the case, and I selected this one, I say, not only because it was the first in his original paper, but because he had more to say about it later. And, I have found a great deal of information about the case in the last year or so. Some of you might have recognized the details as presented here, but are puzzled by the date. In his The UFO Crash/Retrieval Syndrome published in January 1980, Len reported that a fellow named James Minton had told him about another fellow, named William Draeger who talked about a UFO crash in 1950. Len wrote, "I knew the incident well, and that it had been disputed by some researchers, however, I had not pursued the case beyond having referred to the alleged crash in my pervious paper. At that time, I had used information related by Todd Zechel to the Midnight Globe (not exactly the most reliable of sources). Since, further research into the case by Zechel and others has revealed that not only the year of the incident was wrong, having changed from 1948 to 1950, but also the crash site was changed." 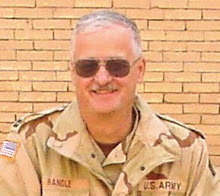 He printed a letter from Draeger who said that he had learned more about the crash, including information from an unnamed high-ranking Mexican Army officer. Draeger said he talked to the general on the telephone who told him that he knew about the crash but he had no papers or documents to prove it. Draeger asked if the general would go on camera for an interview and the officer agreed. When they arrived at his home, however, the general denied any knowledge of the incident. On camera, the general said he knew nothing about the crash. Since that time, I have learned that Zechel never bothered to "vet" the retired colonel he had found in Pennsylvania. Everyone, including Len, believed that Zechel had done that. When I attempted to verify the "colonel’s" credentials, all I could learn was that he had been a low ranking enlisted soldier who entered the service in December 1945 and was released from active duty in January 1947. I have learned that the this colonel, the Pennsylvania man, was an officer in the Civil Air Patrol who has now changed the date of the crash to 1954, or 1955, or maybe 1957. He wasn’t flying F-94s out of Dyess because the F-94 didn’t exist as an operational fighter in 1948 and Dyess didn’t exist in 1948. He has made many changes to the original story as some of his "facts" were found to be inaccurate. Len’s research here, then, provided some of the basics of the case and opened it up to the research of many others. When Len first reported the case in 1978, it seemed to be a very good one, especially because of the high rank claimed by the witness. Later, as I became interested in UFO crash/retrieval stories, I accepted it as well because an Air Force colonel had signed an affidavit about it. High-ranking military officers simply wouldn’t jeopardize their reputations by telling a story that was so incredible unless it was true. I knew of many witnesses who claimed high military rank who had not attained it but just claimed it, but I was also convinced that a real officer who had worked all his career to get to this high rank would not make up such a story. I believed then, as Len did, there was some truth to this. But it all hinged on that Air Force colonel. Without him, the tale took a nose dive. As I have reported in the past, the man was not an Air Force officer, but a CAP officer. The difference is that CAP officers are volunteers in a civilian auxiliary of Air Force, but they are not Air Force officers. Those who have served in the Air Force or the CAP know the difference. This guy, Robert Willingham tried to blur the difference to make him into something that he wasn’t. So now I have taken one of Len’s first reports, actually Abstract I from his 1978 MUFON presentation and followed the investigation to the end. We now have what I believe to be a solid answer for this case which is, simply, it didn’t happen. Len started this process by publishing his information about it and I ended it for him. I believe Len would appreciate what we all have learned about this case. He would appreciate that we could now close it. But this was not a criticism of Len or his work. He used, in 1978, the best information available to him. In 1980, he added to our knowledge by reporting on the changes to the case which made him suspicious. It wasn’t until 2008, as I was preparing my book on UFO crashes, that I found, originally through the Internet, more data, and that I discovered no one had bothered to learn if Willingham was telling the truth about his military career. Len thought others had done it and I thought others had done it. It wasn’t until I asked those others what they knew that I learned that truth. This case unraveled because of Len’s work. He raised the original suspicions about it. He was the one who supplied the information about the shifting date, and without Len, we would never have learned what we did. In that article I saw, it seemed to suggest that I was criticizing Len, but such was not the case. He was a valuable member of the UFO research community, and would have published the latest and best information the moment he had it. Len’s work and legacy can’t be ignored. He was a true pioneer, a true researcher, and the UFO community is much poorer with him gone.